Virtual assistants (VA) can help you and your business flourish efficiently and affordably, simply by outsourcing. Hubstaff has compiled a list of virtual assistant companies in the Philippines that could help you organize your schedule, professionally handle administrative tasks, take care of errands, minimize meaningless repetitive jobs, enable you to focus on your most important jobs and increase your overall job satisfaction. Read our article on top virtual assistant software to find more ways to find and manage virtual assistants. When finding virtual assistants, it’s important to choose professional BPO companies whose candidates have experience and training. The Philippines regularly scores highly on the Global Competitiveness Index, making them a great option for writing, content and communication task outsourcing. No matter where you find your next hire, remember to invest in solid tools for virtual employee tracking to ensure time is being spent properly and productively. Task Bullet has offices based in California, USA and Manila, the Philippines. This virtual assistant company utilizes Filipino professionals to help your business with tasks such as administrative support, accounting, data entry, writing and social media marketing. It offers support services right in America and can help your business tap into the outsourced potential in the Philippines. This virtual assistant company will get your tasks done in just a few easy steps. Just sign up, pay for your initial hours and Task Bullet will assign you your very own personal assistant. Send your virtual assistant jobs with detailed instructions, and watch your to-do list shrink. Your VA will send reports, check-ins and transcripts based on your preferences. Virtual Staff Finder is based in the Philippines and has over 10 years of outsourcing experience. They recommend hiring a virtual assistant so you can focus on growing your business instead of doing busy work to maintain it. Their founder, Chris Ducker, has also written an interesting guide to paying your virtual assistant in the Philippines. You can find a VA with Virtual Staff Finder in five easy steps; sign-up, sourcing, testing, interview and hiring. This company will help you define your job description, select and test qualified candidates and sends you the top three candidates for your job for an interview. Basically, they narrow the field to the top three most qualified candidates for your position, from whom you can select from. Outsourced was founded by Mike Larcher, who has almost two decades of business experience. From customer service representatives, administrative assistants, and HR officers to information technology experts, Outsourced can help you find the right VA for your company. Outsourced prides itself in being able to provide businesses with competent and full-time virtual assistants in the Philippines. The process is quite simple at Outreached: all you have to do is provide a description of the job, and they will handle everything else. They will find the VA you need, and provide the workspace and office equipment required to do the work, helping you save on overhead costs. 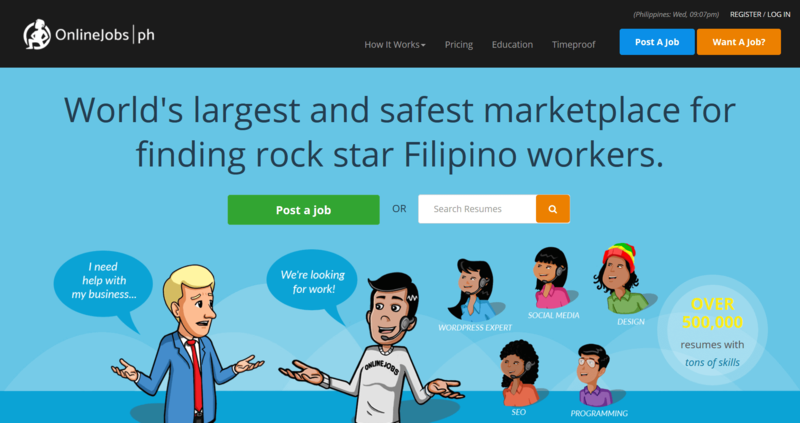 Remote Workmate is a virtual assistant company based in Australia that promotes the benefits of hiring Philippine-based remote talent for Western countries. They offer a free trial period and recruitment support services, such as reviewing resumes and crafting job descriptions. Remote Workmate also offers a free employee swap program, so in the unlikely event your virtual assistant is a bad fit for your team, you can switch to a different employee. Although this company doesn’t have a Philippine branch, their candidates are Philippine-based and can handle online marketing, sales, customer support, content writing, graphic design and more. According to their website, the three things that make them a “go-to Philippine-based virtual staff finder” are: 1) a fast and free recruitment process; 2) a single monthly invoice that covers everything from payroll management to employee services; and 3) a no work, no pay policy. Virtual assistant services are paid per hour. Virtual Done Well is based in Davao City, Philippines and offers virtual assistants who can manage your emails, book your appointments and take your phone calls. In addition to personal assistant services, they also offer Internet marketing and web development packages. Virtual Done Well also offers to train clients on how to best utilize their candidates. In order to hire a virtual assistant with Virtual Done Well, just to fill out a survey form and someone from their management team will get in touch. Their pricing packages are in Australian dollars and a full-time virtual assistant costs approximately $800 AUD a month. Pepper Virtual Assistant is a virtual staffing company based in Manila, Philippines. They charge hourly for services such as administrative assistance, Web design and development, call center and Internet marketing. Pepper offers both full-time and part-time dedicated virtual assistants, and even if your personal assistant is full-time you only have to pay for the time he or she spends working for you. Pepper offers an initial five hours of free services so you can see if they are a good fit for your business. Begin filling your hiring needs with Pepper by signing up, choosing which plan suits your needs and beginning your free trial. 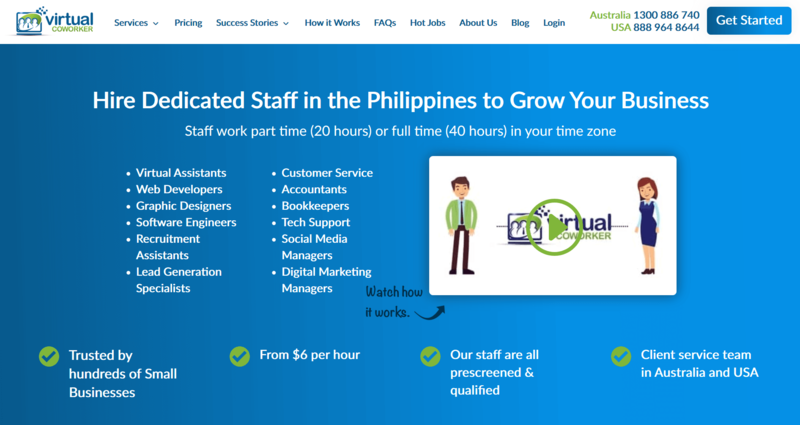 Virtual Coworker has offices in Australia and the USA, with dedicated recruiters in the Philippines. They have full-time and part-time staff that are available to work in multiple time zones for affordable hourly prices. Virtual Coworker boasts university-educated personal assistants who can manage lead and prospect generation, bookkeeping, research and data entry, CRM, social media, customer support, content writing and meeting schedules. This virtual assistant company offers full-service payroll management, hassle-free billing and invoicing, full-time customer service support and recruitment services. Their recruitment team will source, screen and interview potential candidates in the Philippines based on your needs and shortlist the most qualified virtual assistants. With over 250,000 registered profiles, OnlineJobs.ph has an immense database of virtual assistants. On top of that, more than 10,000 Filipinos join each month. OnlineJobs.ph is based in the USA, and believes that Filipinos’ culture and general proficiency in English make them ideal virtual workers. For as little as $350 a month, you can hire competent professionals in different fields like web development, SEO, and social media. To start looking for the right VA for your team, you can either post a job or search for ideal candidates. Once you have created a shortlist, it becomes a matter of communication between you and your potential employees, followed by negotiating their salary and explaining job expectations. 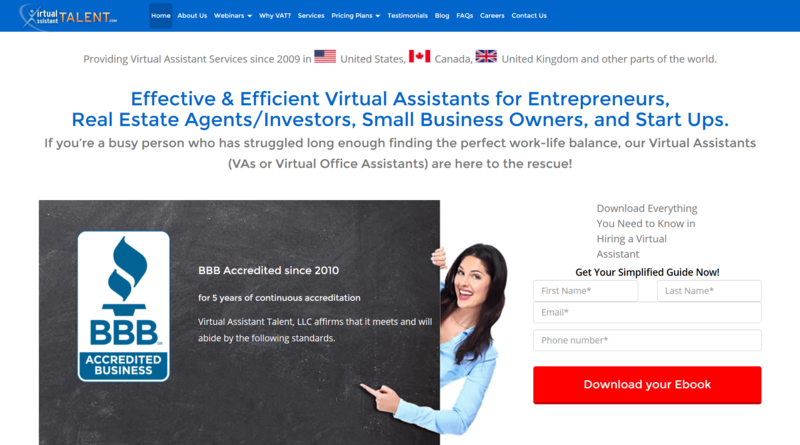 Virtual Assistant Talent LLC is dedicated to helping small business owners, startups, and all busy entrepreneurs to grow and expand their businesses by hiring a virtual assistant. The business was established by John Davern, Jr., MBA as a result of his own experience and business needs. Virtual Assistant Talent is based in California, but has clients in the Philippines, Australia, and the UK. Hiring VAs with Virtual Assistant Talent begins with a phone consultation, where you discuss the services you need in your business. Virtual Assistant Talent will choose the VA that fits the position you are trying to fill the most. Once you have decided on hiring, Virtual Assistant Talent will send you an invoice, after which you can start working with your new VA.
Hubstaff Talent connects virtual assistants and clients with efficiency and finesse. It’s a free directory for companies looking for remote talent across the globe. There are no markups and no fees on either side (freelancer or business owner). That means virtual assistants get exactly what their client pays them. Search through 60,000+ candidates and companies or get bids on your job. This free platform displays a candidate’s hourly rate, skills, experience, availability, resume, and languages spoken. VAs also have the option to add a short “about” description to provide more information on themselves. Profiles can be filtered by skill, availability, years of experience, or country. You can also run a search for keywords or phrases. Find out how Hubstaff can help you track efficiency with activity levels, screenshot monitoring, timesheets, and analytical reports. You can even schedule automatic payments right in your Hubstaff account. It’s the easiest way to manage virtual assistants. This post was originally published April 2015, and updated January 2019.